French 16th-century brown calf, gilt-tooled with instruments of the Passion on each corner and with flowers on the spine, rebacked, brass clasps and catches. Celestine convent of Marcoussis, diocese of Paris, sixteenth century; a resident of Beauvais (? ), seventeenth century; Cathedral or City Library of Beauvais, 1869 (inventory label, no. 1084); Leo S. Olschki, Florence; C.W. Dyson Perrins; his sale, London, Sotheby's, Nov. 29, 1960, lot 108; purchased there by Maggs Brothers Ltd., London for William S. Glazier (1907-1962), New York; deposited in the Pierpont Morgan Library by the Trustees of the William S. Glazier Collection in 1963. 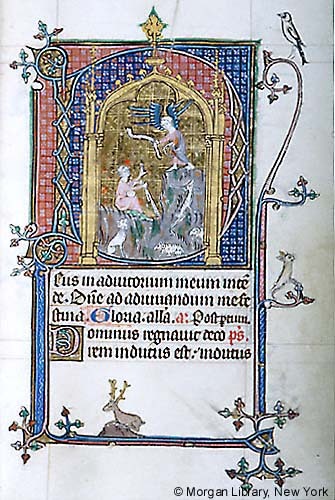 Ms. book of hours portion from a psalter-hours; variant of the use of Arras (Hours of the Virgin); written and illuminated in France, probably the diocese of Arras, ca. 1310. Decoration: 7 large historiated initials, 3 small historiated initials, numerous decorated initials, small animals or grotesques on all pages.